The future is now. Robots are increasingly part of our lives and it is not just the younger generation enjoying the newest technological developments. 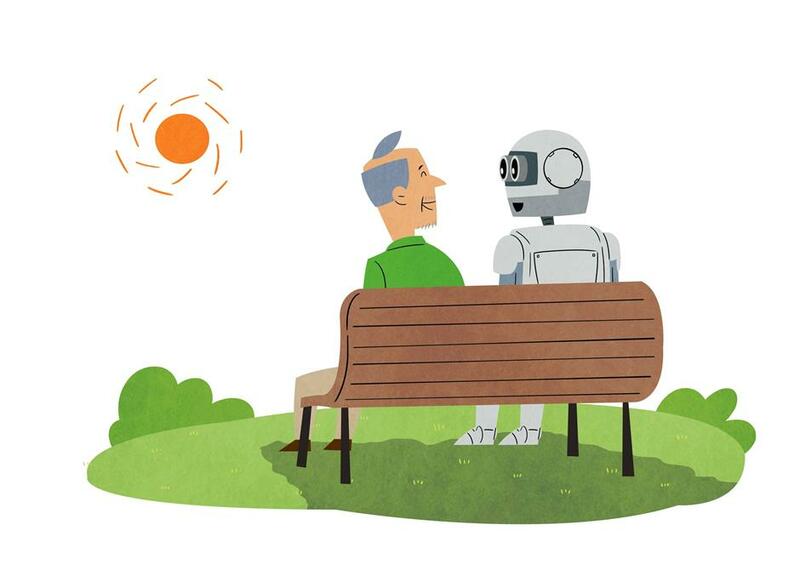 The older generation, some wary of hi-tech gadgets and social media, are also in for the benefits of robotics, artificial intelligence and machine learning — big words that will make big changes. Many of these technical terms might seem intimidating to some, especially the elderly. Often they are hesitant to adopt innovations which seem threatening. This only highlights the gap between the older and the younger generations who quickly embrace change. A young, vibrant firm in Israel is using their knowledge in these fields to help elderly people, by making technology more accessible while helping them with the challenges of being senior citizens. ElliQ, a sleek proactive robot, is meant to do just that. Dor Skuler is the co-founder and CEO of Intuition Robotics which has created the robot. She plans to alleviate the loneliness in the lives of many older people through some very sophisticated technology. “Her (ElliQ’s) goal is to help older adults stay active and engaged so that they don’t fall into loneliness and social isolation. It’s a huge problem facing modern society all over the world,” Skuler told Xinhua. Some are calling it the “loneliness epidemic.” Studies have shown increased levels of people saying they are lonely with the unwanted side effects often taking a toll on their physical health. Technology enables us to keep in contact with more people in a much easier way. For the elderly, technology and robotics can be used to enhance their daily lives while not replacing contact with real people. “The goal of ElliQ as a product is not to replace human contact, it’s actually the opposite. One of the main goals of the system is to fuel her ability to be proactive, to connect people to their loved ones or to nudge the older adult maybe to leave the house and not just to watch TV, to go out and meet new people or just enjoy a beautiful day,” said Skuler. Parallel to the aging population, there is also an increase in the global robotics market which is expected to grow substantially in the coming year. There are several products on the market — Amazon’s Alexa and the Google Assistant, but according to Skuler, theirs is the only proactive one. In Norse mythology, Elli is the goddess of old age. Adding the Q to her name gives the initials EQ — Emotional Quotient. It is designed to sit on your coffee table and fit seamlessly into your home. She will move, she will tell you jokes, play music that you want to hear and read you incoming messages while displaying the latest selfie taken by your grandchildren. After asking potential users, it was determined that the majority of them wanted a feminine persona. ElliQ’s pleasant voice seems to appeal to people. “One of the design principles for the product was for it to work with and delight users who not only have a hard time using technology but might actually fear technology,” Skuler told Xinhua. In its headquarters in the outskirts of Tel Aviv, Intuition Robotics’ very young programmers and designers work on improving ElliQ ahead of its launch. Currently available for pre-order, it is expected to go on the market in the summer of 2019, first in the United States. It is being sold for US$1,500, a price which includes 12 months of technical support. This is where they see their largest market. Beta tests have been conducted there. They then plan to expand sales to Japan, where this is a great interest in robotics and a fast adoption of new robotics tech. The technology behind ElliQ is cutting edge. Protected by various patents, it uses machine learning and new algorithms that, according to Skuler, are new to the world of robotics. Dubbed “the active aging companion,” according to Skuler, user feedback has been very positive. They liked being surprised by the robot, not wanting to anticipate her next step. It is proactive, and thus different to other products on the market which usually react to commands. It looks really simple — a tablet and a speaker — but Intuition Robotics believes it will be life changing for those who choose to use it. “We actually think that it helps bridge a digital divide and helps with a needed nudge to break the routine and help people connect to their family and their community,” Skuler concluded.